A Chicago architect thinks these golden pig balloons are the best way to hide the Trump Tower sign. 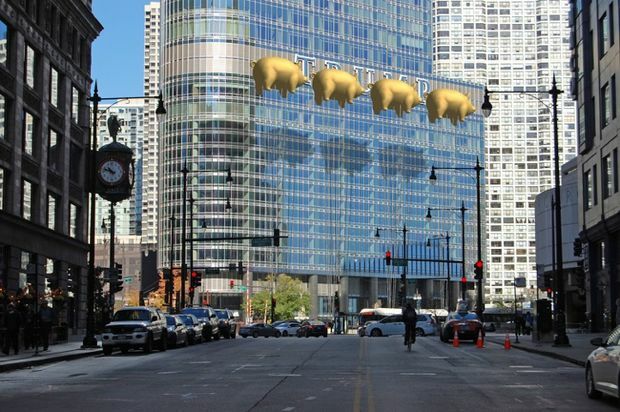 DOWNTOWN — A Chicago architect wants to hide the massive Trump Tower sign with a row of strategically placed flying golden pigs, a display aimed at providing "visual relief to the citizens of Chicago." 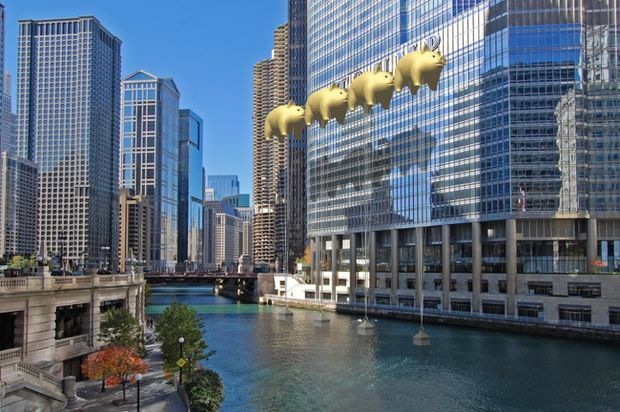 The idea, a self-described "folly" from Jeffrey Roberts at Chicago-based New World Design Ltd., isn't part of a formal proposal, but his renderings of "flying pig" balloons tethered to the Chicago River aim to address Chicago's objections to the tower's 20-foot-tall letters, which were in place long before the real estate mogul was a contender for the presidency. "The folly is a design effort by NWD to provide visual relief to the citizens of Chicago by interrupting the view of the ostentatious Trump Tower Chicago sign," Roberts wrote in an email. Roberts said the pigs pay homage to Pink Floyd's "Animals" album, which, like George Orwell's Animal Farm, depicts pigs as the rulers of society. The piece has four pigs — one for each year of a Trump presidency — and are painted gold "in a commentary of the gaudy style of Mr. Trump’s own gold-ensconced penthouse interior he has labeled 'comfortable modernism,'" Roberts wrote. The pigs fly to represent the chance the public thought Trump had to win the presidency, Roberts wrote. The big sign at Trump International Hotel & Tower, 401 N. Wabash Ave., has been controversial ever since it was installed two years ago. Architecture critics and local pols, including Mayor Rahm Emanuel, have called the big sign tasteless, while one tour guide has made it a stop on her Downtown "disaster" tour. The City Council moved this fall to remove a smaller, honorary street sign near Trump Tower over Trump's controversial campaign remarks, but the sign remains up, the Council deciding its removal is not a "high priority." A Trump Tower spokesman did not return calls for comment.